Evening Standard journalist and Herne Hill resident Andrew Neather has written an interesting article in todays paper about London's bike boom. This Saturday, 2 July 2011, spend a sublime afternoon on Streatham Common relaxing in Transition Streatham's pedal powered cinema, showing a wide range of environmentally themed shorts, from documentaries to cartoons, including: Wallace and Gromit, The Story of Stuff, Your love is in my Cornflakes. Bring your bike to fuel the cinema! A leisurely ride along the riverside from Clapham to Richmond Park followed by lunch at Pembroke Lodge. Join us for a ride around the borough sourcing local foods and visiting key food growing projects followed by a barbecue in Myatts Fields Park. The ride will set off from Myatts Fields Park and the barbecue will be held nearby from approximately 4:30pm onwards. Meet 1pm at the bandstand in Myatts Fields Park, Calais Street, SE5 or contact Luke Evans (lseevans@yahoo.co.uk/ 07973 786015) for details of the barbecue. Our regular meeting upstairs at the Priory Arms, Lansdowne Way, Stockwell. Join us for a day long look at the architecture of Norman Shaw. Richard Norman Shaw was the late-Victorian who broke through the Gothic / Classical stand-off in architecture by embracing an English vernacular style spiced up with Dutch and Flemish touches. Variously described as "Old Sussex", "Queen Anne", "Sweetness and Light" and "Freestyle", this featured red brick, white woodwork, gables, dormers, fancy plasterwork and raging assymmetry. He inspired a generation of architects to sometimes wild experimentation, and we'll see how the style plays out in studio houses, artistic suburbs, mansion blocks, offices and country houses in the town. John Betjeman called him "the founder of modern English architecture at its domestic best". Meet in the park opposite Turnham Green tube station, Turnham Green Terrace, W4, at 10.45 for an 11.00 start. If you don't want to ride out there, you can take your bike on the District Line. If you get there early, there's a cafe, the Trinity, round to the right from the station. We are working with Lambeth on this fantastic all day ride event to round off Bike Week. Pick up a passport from one of four vibrant hubs and navigate the route around the sites of Lambeth on foot or by bike collecting stamps along the way and spotting the specially placed bikes to win prizes. Absolutely everybody is welcome and can ride with colleagues, family or friends, for fun or for charity. More information at www.biketheborough.co.uk. On Tuesday morning cyclists passing along Brixton Road were offered coffee, tea and doughnuts by Lambeth Cyclists, the Lambeth branch of the London Cycling Campaign. In addition to the refreshments cyclists were offered bike repairs and advice from cycle mechanics as well as cycling information. The event was staged to inform cyclists about Bike Week events scheduled to take place in Lambeth from Saturday 18 to Sunday 26 June 2011. Details of the programme of events are given below – all events are open to everyone; just turn up and cycle away! 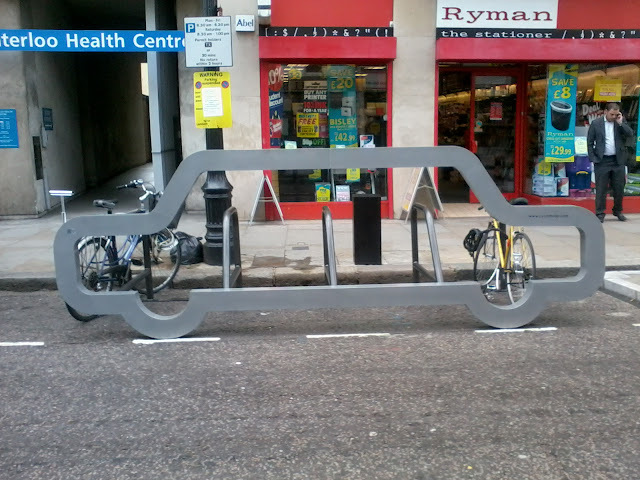 On Lower Marsh, near to Waterloo Station, in Lambeth SE1 Lambeth Council have installed a cycle parking facility that dramatic illustrates the efficiency of bike parking when compared to car parking: 1 car = 10 bikes. Lambeth have used these illustrations at events before but have now installed it for one month on the street. If this trialis successful it is hoped that car parking spaces across the borough can be converted into cycle parking along these lines reducing the need for cyclists to chain bikes to signs and railings etc which can obstruct the pavement. Transport for London are asking for feedback on the cycle superhighways. As we approach the first anniversary of the implementation of routes 3 and 7 TfL are asking for cyclists' views on the superhighways - complete the short survey on the TfL website. We have received feedback from many cyclists across Lambeth expressing concern about the "difficult and dangerous" situation when travelling Southbound on CS7 on the corner of Kennington Park Road and Brixton Road near to Oval tube station - concerns that we have raised with TfL and Lambeth and Southwark London Assembly Member Valerie Shawcross. 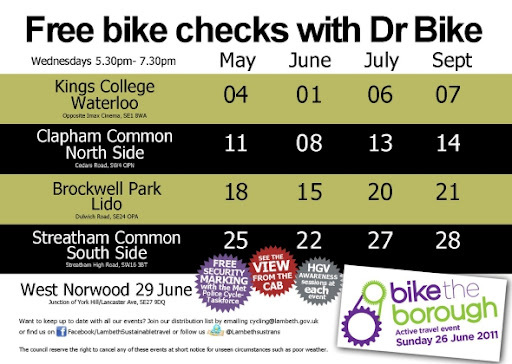 Lambeth will be running free Dr Bike bike checks every Wednesday throughout June and July. See below for a list of dates and locations for this free service. As well as basic checks, repairs and adjustments to your bike you can also have your bike security marked and gain an idea of what lorry drivers see from their cabs and how to minimise the danger by remaining visible at all times.